To get the best results and make sure both your load and the people securing it stay safe, it's important to use the right materials, tools and techniques. Here are a few tips to keep in mind. 1. Make sure your strapping has the appropriate break load. The break load (or break strength) of a strap is the amount of force required to break it. The break load rating of your strap should be well above the expected force that it will be subjected to so that you have a safety margin. However, using heavier strapping than needed for your load is a waste of money and may not be as effective. The right break load depends on the total weight and size of your load, the number of straps you are using to secure it, and the forces it will be subjected to during transit due to road conditions or the stability of the load. If you're not sure what strength of strapping you need, talk to one of our strapping experts. 2. Choose the right strapping material. Strapping comes in different materials, including steel, polyester (PET) and polypropylene—each with their own pros, cons and recommended applications. The right material will depend not only on the size and weight of your load but also on factors such as how much your load may settle or shift during transport, the length of time the strapping will need to maintain its tension, and how much exposure it will have to moisture, sunlight or corrosives. 3. Tension your load properly. Strapping is designed to be applied under tension—that's how it maintains its hold to keep loads stable. Different strapping materials have different elongation, recovery and retained tension properties, which will impact the amount of tension you want to use when applying the strapping. All strapping will relax a bit after tensioning, so you need to allow for that relaxation when applying tension to the load. At the same time, you don't want to over-tension your straps or you may risk damage to your products or cartons. Using the right tensioning tools will help ensure that your load is secured properly. 4. Use the right sealing method for the job. There are different seal options available for strapping. Seal selection is important; the seal will become a weak point in your strap. Metal seals for steel strapping come in open, closed/thread-on, push-type, open flange and magazine-fed varieties. They are applied with a manual or automated strapping sealer, which crimps them closed over the strap to hold it securely in place. These seals generally have a 75% or greater seal joint efficiency, meaning that the seal joint will break at 75% of the overall load capacity of the strap. Metal seals for PET or polypropylene work in a similar fashion to seals for steel strapping, but are optimized for these materials. Make sure you choose a seal designed for use with the strapping material you are using. Buckles can be either metal or plastic and are generally used with polypropylene strapping for light- to medium-duty applications. Buckles have the advantage of being reusable—you can release the tension to open a package or crate and then reseal it again using the same buckle. Heat sealing is used for either polypropylene or PET strapping. An electrically heated blade is inserted between the straps to melt the facing sides. This creates a molten "weld pool" that creates a strong, secure seal between the two straps as the plastic re-solidifies. 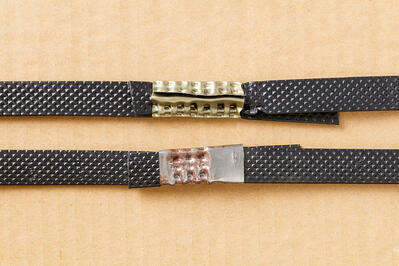 Heat sealing is fast and provides a stronger seal for plastic strapping than buckles or metal seals. Friction welding is similar to heat sealing, but uses a machine that creates friction by rubbing the straps together at high speed in order to create the molten weld pool. Friction sealing creates the strongest possible seal for PET or poly strapping, resulting in a seal with a break load nearly as high as the overall break load for the strapping itself. It's a great option for high-production machine strapping using PET or polypropylene. 5. Protect your products or cartons. Strapping can crush or damage cartons or products if not applied properly. To avoid damage to palletized cartons, be sure to use edge protectors. These corrugated or plastic devices spread the force of the strapping so that it does not cut into the edges of the boxes. When strapping a load that is crushable or delicate, consider using more straps with less tension rather than a smaller number of high-strength straps under higher tension. Need help selecting strapping tools and materials? Pantero carries a wide selection of strapping, strapping seals and strapping tools. We can help you find the right materials for your job. Contact us to talk to one of our strapping experts.